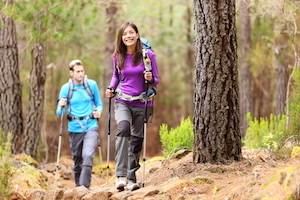 What’s the Best Credit Card for Outdoor Enthusiasts? If communing with nature is your favorite way to spend the weekend, you’re in luck. Not only is fall the perfect time of year to get outdoors, the Nerds have a few credit card suggestions that will reward you handsomely for the things you need to enjoy your favorite hobby. The Nerds rarely recommend retail credit cards, but if you spend a lot on outdoor gear and want to take advantage of REI’s legendary, no-questions-asked return policy, opting for the Rei Mastercard might be a good choice. With this card, you’ll earn 5% back on all your purchases made at REI and 1% back on purchases made elsewhere. That’s a very high rewards rate for your REI spending, and nothing to sneeze at for your non-REI purchases, too. Plus, the card’s $0. You must be a member of REI’s rewards program to get the card, which requires a one-time $20 donation, but the rewards you earn with the card are on top of the bonus you’re already getting as a member. Usually, this is 10% of your eligible purchases, paid out as an annual dividend. That brings us to the one big drawback of the card: You can only redeem your rewards (those earned with the card and those you’ve built up as a rewards program member) once per year. But this could make for a pretty killer annual shopping spree to upgrade your gear, or replace items that you’ve lost to wear and tear. All in all, if you’re an REI devotee, this might be a good card to add to your portfolio. If you’re a city person who craves outdoor adventures to get away from the hustle and bustle, you probably have to drive a fair distance to find a spot remote enough to truly unwind. In this case, you’ll want a card that provides good rewards on gas, and the Chase Freedom® definitely fits the bill. With it, you’ll earn 5% back in rotating quarterly bonus categories, up to $1,500 spent per quarter. Plus, you’ll get unlimited 1% cash back on all other purchases. Gas stations have historically been featured as a 5% bonus category at least one quarter per year. This will go far toward getting you on the road faster for your next biking, hiking or backpacking trip. The Chase Freedom® charges an annual fee of $0 and even provides a small sign-up bonus: Earn a $150 Bonus after you spend $500 on purchases in your first 3 months from account opening. All in all, there’s a lot to love about this card. Keep it in mind for the drive to all your outdoor excursions.